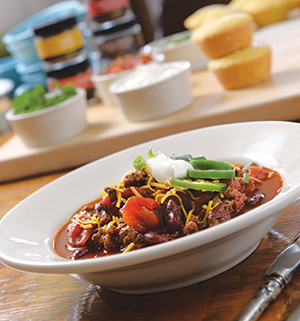 Based on a recipe by Allspice’s Rory Brown, this chili’s blend of spices makes it a standout. From college until just a few years ago, I made the same chili recipe winter after winter. Then I tasted Rory Brown’s Smokin’ Coffee Chili and realized there was no going back. Brown is the owner of Allspice Culinarium, the East Village flavor emporium whose herbs and spices you can smell from half a block away. It figures that this spice maven would know a thing or two about chili. After all, what we love about the dish—beyond its comfy heartiness—is that blend of warming seasonings that thaw you through and through on a cold winter’s night. Brown’s recipe adds smoky angles to the mix, making it all the more toasty and flavor-charged. A great thing about chili in general, and Brown’s recipe in particular, is that it’s infinitely adaptable. In fact, Brown has told me that he fiddles with his chili a little differently every time he makes it, often depending on what ingredients he has on hand and what he’s craving. Over the past few winters, I’ve taken Brown’s original recipe and fiddled with it myself to come up with the recipe below (the addition of smoked black pepper and smoked paprika are among my tweaks). Go ahead and adapt it your way. Use another kind of beans (such as pinto or black beans), if you like. My favorite meat to use, however, is George’s Grind from Gateway Market. This mix of Certified Angus Beef brisket and chuck truly beefs up the chili with extra meaty flavor. And yes, you can play with the spices, but do try it our way first. See the accompanying story on page 36 to see what each spice brings to the mix. Assorted toppings: crumbled bacon, sour cream, chopped fresh cilantro, chopped green onions, shredded cheese and sliced jalapeños. Heat oil in heavy large pot over medium-high heat. Add beef and onions; sauté until onions are tender and beef is brown. Mix in chile-coffee rub, chili powder, smoked paprika, cumin, oregano, smoked black pepper and garlic. Cook and stir 1 minute. Mix in tomatoes, tomato sauce and water. Place toppings in individual condiment bowls. Ladle chili into bowls and serve toppings alongside. Makes 6 servings. Some of the spices in the recipe need no introduction: Chili powder, for instance, is a must in chili, and cumin finds its way into many good Tex-Mex stews. The other seasonings, however, are what make this chili one of a kind. Chile-Coffee Rub: While this blend also contains paprika, mustard and ground chilies, it’s the espresso beans that are key here. “The coffee flavor brings an earthy, deep, rich flavor to the chili,” Brown says. Also try using this blend in baked beans. Dried Mexican Oregano: According to Brown, Mexican oregano, which comes from a shrub-like plant, is completely different from Mediterranean oregano. “Mexican oregano is good in chili because it’s more earthy and peppery and not minty or as sweet as Mediterranean oregano,” he says. Smoked Bittersweet Paprika: This spice deepens the dark-red hue of the dish, and also adds a touch more smokiness without adding too much extra heat. Smoked Black Pepper: This brings just what you’d expect—a pleasing peppery spark as well as another angle of smokiness. Try it in your next bloody Mary mix, too. Chipotle Chili Powder: Made from chipotle peppers, which are jalapeños that have been smoked, this powder brings yet another angle of heat and smoke to the dish. Start with a little, and add more if you like your chili hotter and smokier. These spices are available at Allspice Culinarium, 400 E. Locust St.; 515.868.0808; allspiceonline.com.